WinOptions is a quality, easy-to-use binary option broker for new traders, but advanced traders may find it to be lacking. The interface is clean and easy to use and allows you to look at multiple trades at ease, but lacks any charts or sophisticated information. WinOptions was founded in 2010 and is based in Cyprus. WinOptions’s 100% web based platform is its brightest and darkest side. On the positive side, you can trade from anywhere in the world you can get an internet connection and it is clean and easy to use. It lists the options in a tabbed fashion that makes it easy to see and move between many different binary options at once. You can easily move from the forex binary options tab to the commodity option trading. The interface is great for traders who want a clean and easy to see platform. Placing trades is very easy. Every asset is on its own row, with a price, the expiry time, and payout clearly marked. You can get started trading very quickly and with a very short warning curve. This, however, is also its biggest weakness. Not having any charts, graphs, or information robs you of the information you really need to make profitable trades. If you can find the charting tools that you need in other platforms, WinOptions still is a great option even for advanced traders. The platform is also available in 12 different languages and you can hold accounts in Euros, Pounds, and Dollars. The languages you can trade in include English, Chinese, Spanish, Japanese, Portuguese, German, Arabic, French, Russian, Korean, Turkish, and Italian. With WinOptions, you can trade over 250 different assets, including commodities, stocks, currencies, and indices. The payout for most options can be as high as 85 percent of your investment and there are no monthly fees associated with your account. You can also choose from one hour, one day, and one week expiry times. On top of all of this, you can also get a $250 bonus just for opening an account. There are also no withdrawal limitations and the minimum deposit is a very affordable $100. WinOptions also provides you with a free binary options demo account. You can use your demo account to get used the platform and develop your trading strategy before you risk your real money in the market. The customer service from WinOptions is generally friendly and knowledgeable. The live chat operator that I talked to was helpful and the wait time was very short. If you prefer to talk on the phone, WinOptions offers support numbers in the US and UK. You also get access to a free personal account executive depending on the size of your account. Support is available 24 hours a day, 7 days a week. 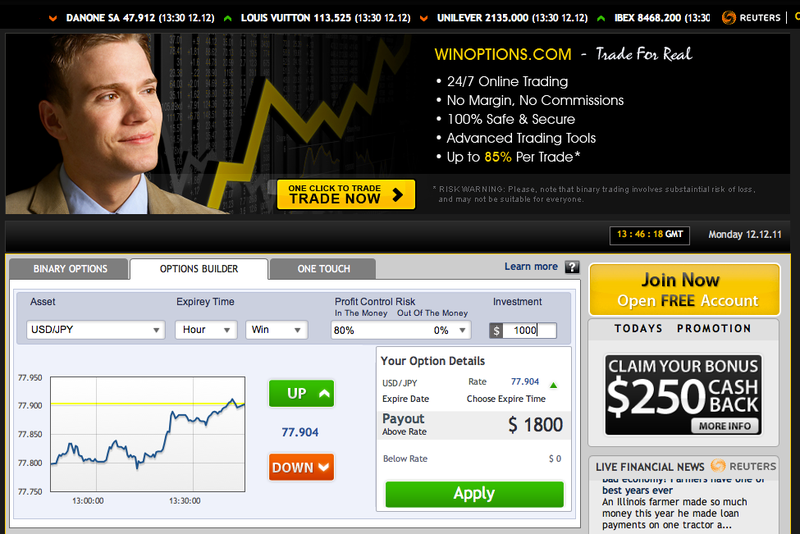 WInOptions is a great platform for traders just starting out in the binary options market. It lets you see your trades and make them quickly and easily. However, this is only useful if you can get your information and charts from another source or platform. Without the access to the advanced features and charts, it can be incredibly hard to turn a profit or put together any kind of trading strategy. Ultimately, the WinOptions platform falls short where it counts the most. The lack of documentation and training on the website and the lack of technical information and graphs mean you should probably find a more robust broker. The redeeming quality of the site, namely the easy, intuitive interface, simply is not good enough to make up for these big downsides.